This sling bag is surprisingly big! Having revealed my latest pattern customization project last time, this week I will provide the details as to how it came about. For anyone interested in applying some of the same changes, I'll share the dimensions of any added pieces where applicable. Note that this post is not meant to be a "how to" tutorial for basic techniques, as I assume you have prior experience sewing bags. You can make an adjustable strap the traditional way, but to tell the truth, sometimes a shortcut is in order. I don't imagine that anyone will have an identical section of a 5/8" fabric belt to contribute to this project, but here are my particulars in any case. After turning the strap pieces right side out, I tucked about a half inch of fabric to the inside at one end and pushed the the belt segment into it. With a little bit of nipping and tucking and pinning, I was then able to topstitch around the perimeter of the strap to secure the belt piece. To make a fully lined zippered pocket assembly that can be sewn in place on top of the body panel in the same way as the original pattern calls for, you'll need two fabric pieces to "sandwich" the top and bottom parts of the zipper tape. Cut the top piece 8" wide by 4" high and the bottom piece 8" wide by 13" high. Fold these pieces in half (with right side showing), press, and then press a 1/2" seam to the wrong side of the fabric on the long edges. Then cut two pieces of fusible interfacing — 8" wide x 1.5" high for the top and 8" wide x 6" high for the bottom — and place them inside the folded pieces (right up against the crease) and fuse. The interfaced side will be the top side of the pocket. 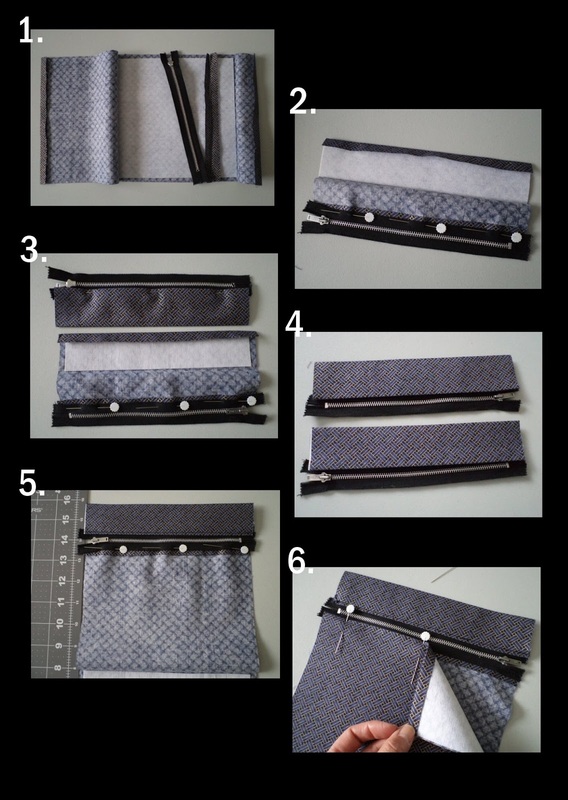 When you sandwich the zipper tape with your pieces of fabric, keep in mind the following: 1) ensure that one assembly zips to the right and the other to the left (refer to picture #4 above), and 2) ensure that the side of the fabric with the interfacing is on top against the top side of the zipper (picture #6). The original would show interfacing inside the pocket, so I am quite happy with this change. In hindsight, however, I probably would have preferred to make a "normal" zippered pocket that sits inside the bag between the exterior and the lining. 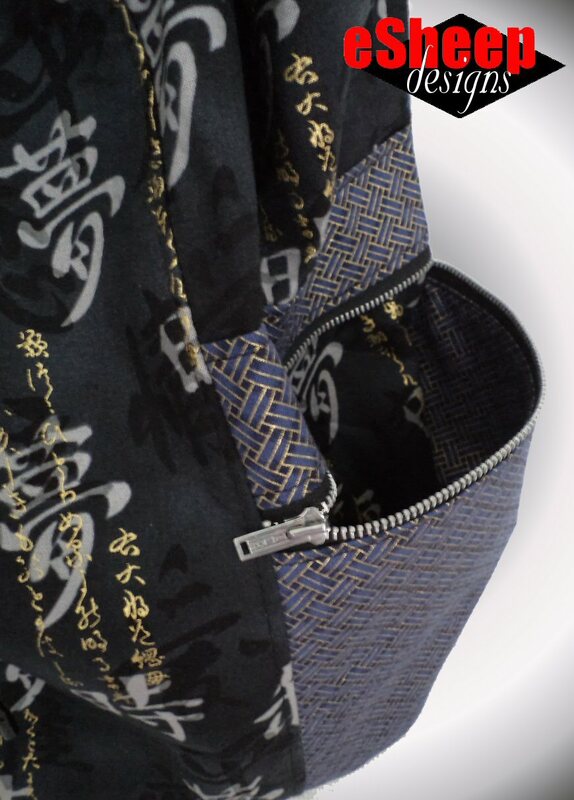 Because this pocket literally sits on top of the bag, its storage capacity is limited. By the way, I didn't partake of the original pattern's "cool factor" by installing the zipper on top of the fabric (with the tape exposed, secured by a zigzag stitch), but it's still possible to do with my variation. This little pocket on the underside of the flap was perhaps my favourite addition. I made it for my car key fob, but it's a great place to keep one's most needed ID, transit pass, or "whatever" card accessible and safe. 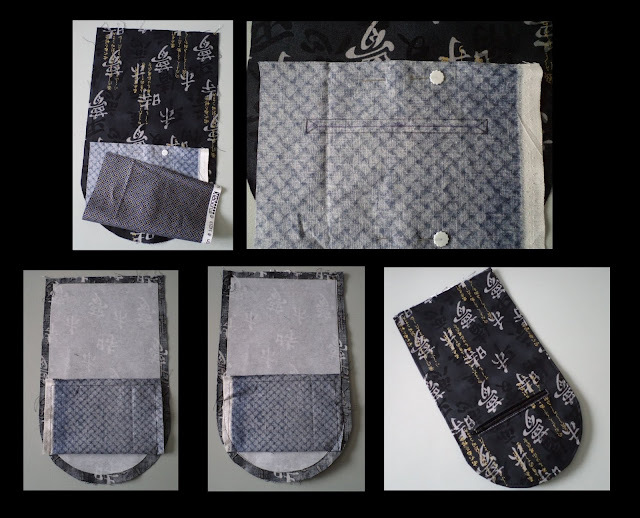 This is an easy addition, requiring just a little bit of fabric for the lining... 6.5" wide by 7" high, as well as a 7" zipper that will be cut down to fit. When it comes time to sew the two flap pieces together to complete the flap, it is perfectly fine — and even desirable, as it keeps the pocket in place — for the bottom corners of the pocket lining to be caught in the seam. When you notch the curve of the flap before turning it right side out, trim away anything from the pocket lining that extends beyond the seam allowance. One of the reasons I am not so much into this style of bag is that it's just essentially one big loose sack. However, I had been using my Bodaciously Basic Bucket Bag all summer long and had gotten used to its "open concept". A sling bag is pretty much the same style. So at first I thought, I am going to leave the lining of this bag as is: no pockets. (I usually use a purse organizer anyway.) With the bag almost finished, however, I made a last minute decision to add a pocket and ended up doing so after the lining was completed; i.e., the bottom of it was already sewn on. It's not the prettiest installation considering how I had to manoeuvre to put it in, but it functions and that's what counts. (I used a 10" wide x 12" high piece of fabric for this and placed it close to the top of the bag on the front side.) Given how deep the bag is, I will definitely appreciate having this pocket. The original Summer Sling Bag is attractive as is, but in my opinion, the flap was screaming for something. Like a 11" x 2.5" strip of fabric that ends up as a 1.5" decorative stripe down the centre attached to a ring (mine measures 2-3/8"). Fold a 1/2" seam to the wrong side of the fabric on the long sides, and fuse a section of interfacing to the middle. Run some topstitching to secure the side seams and the ring. Pin the whole assembly to the top flap piece and sew along the previous stitching lines to attach. I had no difficulties sewing up the flap after making these two changes to it. 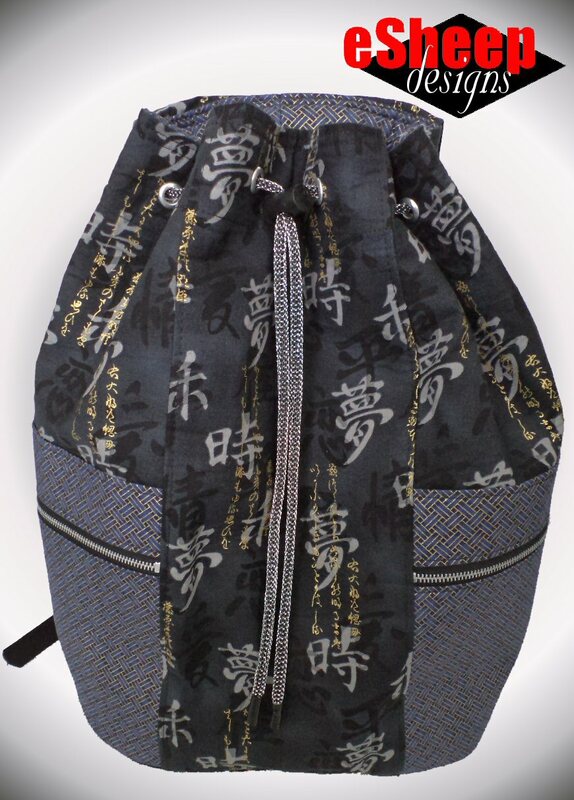 Most back pack style bags have a hanging/carrying loop, so this is an easy, practical addition. Fabric requirement is a 6.5" x 2" strip, done up as a "no turn" style strap (i.e, fold in half and then fold the two sides in towards the middle crease and stitch along both sides on top). In terms of when the loop is installed, it goes in at the same time as the flap. In my case, it was very easy to position the loop evenly on both sides of the decorative stripe. 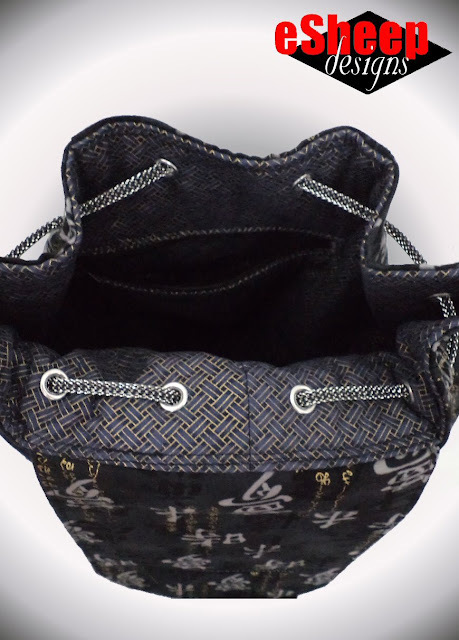 With the use of plain quilting cottons, I needed to ensure that the fabric was strong/firm enough to produce the right look for the bag. For the most part, anything that was made out of the exterior fabric, I fused on some Decor Bond. 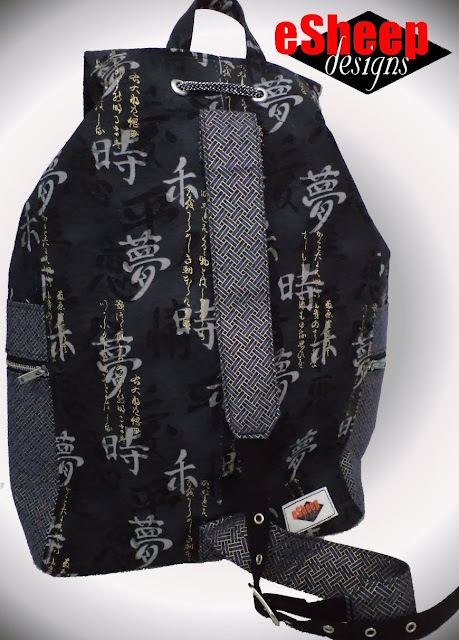 Speaking of fusible fleece, I would suggest that you add it to your strap if you make this bag. I didn't and regret not doing so. So what did I think of this project? Overall, it's a winner. 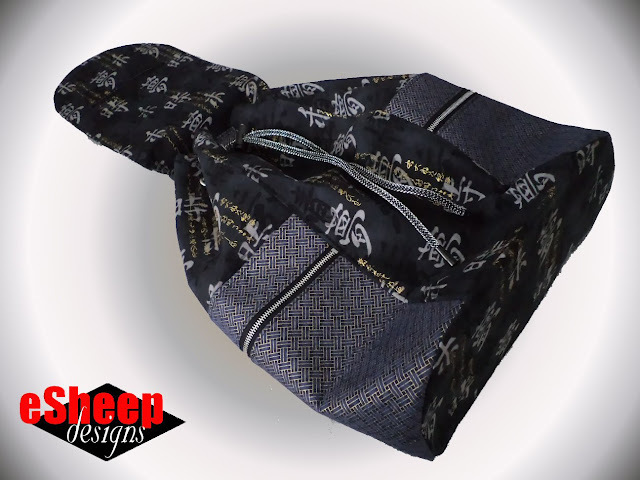 A great looking bag from a free pattern that I was able to customize to a significant degree. Sew4Home doesn't categorize projects in terms of sewing experience, however, so if it helps, I'd have to say that I wouldn't recommend this one to a beginner. (Their highly popular bucket bag from last year would be more of a beginner project; see my customized version here.) There are a few steps that could frustrate a new sewer to no end. See how perfectly pinned the base is in the above picture? Since I'd already sewn the lining base with no issues, I thought, how lucky, the fit is perfect; I should be done in no time! Two hours later, I thought that the fabric along the bottom front edge of the bag was going to disintegrate, I had pulled out the stitching so many times! For whatever reason, it took forever to fix two stubborn puckers. And not only that, a few times, the puckers would be addressed, but then part of the base would shift and get caught up in the stitching. (And in case you were wondering, the Peltex had not yet been fused on, so there was no reason for so much aggravation.) Had the puckering appeared on the back side, I likely would have just given up on it, but at the front? One final observation: twelve grommets are required for this bag. Grommets are not hard to do, but it takes time to poke out just the right size hole — through fabric, fleece and interfacing — without overdoing it. I felt like cheering when I installed the final one and could see the finish line. Everything aside, it was worth it. Coming up four years in, I'm still amazed by what simple pieces of fabric can be turned into, with a little patience and ingenuity! Question: do you still feel elated when you finish something like this or is the whole experience just "old hat" to you? Yes, I still feel elated when I finish most projects, especially lengthy ones, or ones that are new to me.